Nudge nudge, wink wink, say no more! When a character taps their nose, he or she "knows" something. This seems to be a western cultural thing; in Asian cultures, pointing to the nose (or the face in general) is equivalent to the Western gesture of gesturing at your chest to indicate you're talking about yourself (essentially, the unconscious gesture you do anytime you say, "Who, me?") Indeed, nose tapping is almost always dependent on the context in order to make much sense at all what it is. All any of these examples can really say for sure is that tapping the nose means something. Can, of course, be used to indicate The Nose Knows, but not required. Played with in the Battle Royale manga : Sugimura always unconsciously taps his nose whenever he's feeling embarrassment. However most of the time it's because he's saying something he should keep to himself or not saying something he'd want to say. Which means that everyone knows when he's hiding something, except himself. Xellos does this every time he says his Catch-Phrase. Santa Claus does this in 1823's "A Visit from St. Nicholas" (better known as "'Twas the Night Before Christmas"), and it's become associated with the figure ever since. Some interpretations have it as a requirement for him to fly up the chimney, perhaps because later audiences weren't certain what the gesture meant. In Blank Check, the bank manager, who believes he's delivered $1 Million in stolen money to a recently-released criminal, invokes this when the man who was supposed to pick up the money arrives. It doesn't work. In the Made-for-TV Movie of Dead Like Me, the Reapers tap their noses to each other at the end in order to remain incognito. One a scene from the extended version of the film of The Lord of the Rings: The Two Towers. Merry and Pippin stumble upon barrels of pipeweed in the ruins of Isengard. Merry says it would be better to not tell Treebeard about it; Pippin says "Oh, I get it" and touches the side of his nose, too. In Pirates of the Caribbean: The Curse of the Black Pearl, Ragetti does this after Pintel "promises" Elizabeth that they won't hurt her while they're looking for her. 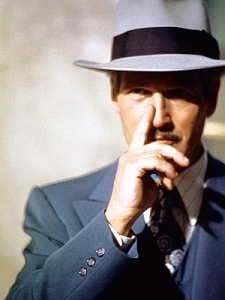 In the movie The Sting, the nose tapping is a signal between the con men. In From Russia with Love, Bond's ally, Kerim Bey does this while referring to his nose as his "old friend", who tells him that "something smells". Frederick does the Charades version in Young Frankenstein. In Charades, tapping your nose and pointing at appropriate player means "On the nose", i.e. "You guessed correctly." Colon tapped the side of his nose. "Politics, " he said. . .
"Why're you picking your nose, sarge?" "I'm tapping it," said Colon severely. "That's to show I'm in the know." "In the nose, " said Nobby cheerfully. In Going Postal, a drunken Crispin Horsefry tries to do this, and keeps missing. Later, Moist experiences the horror that is his "assistant" Mr. Groat tapping his nose. Nesta does it in the last book of the Mates, Dates series. Harry Potter: Gilderoy Lockhart has an annoying habit of doing this. Some of the characters in Redwall do this on occasion. The Fourth Protocol by Frederick Forsyth. The Mole working for SIS inside the Russian embassy starts a casual discussion about the effectiveness of a False Flag Operation. The KGB agent he's talking to doesn't say anything, but does smile and tap his nose, thereby confirming to the mole (and the British) that the KGB is running such an operation. In the The Mysterious Benedict Society books, this is a signature gesture of Mr. Benedict throughout the series, however, Mr. Benedict generally taps his nose to indicate that someone else is right. "Do you think that's what happens to him, (Mr. Curtain) too? Do you think that's why he's so obsessed with controlling things?" Mr. Benedict tapped his nose. "Very astute, Reynie. I've often wondered that myself." Just watch Doctor Cox closely, nay — at all, sometime. Ever. John McGinley does this as an homage to Paul Newman from The Sting (see page image). Seen in Hannah Montana: Hannah is interviewing prospective bodyguards. One says in reply to a question "It's better not to know" and touches the side of his nose. In an episode of Are You Being Served?, Captain Peacock indicates with this gesture that he knows something about somebody other than himself being promoted to Mr. Rumbold's position, but has been told not to say why. Mr. Lucas takes the gesture as meaning that Captain Peacock didn't get the position because he's Jewish. Captain Peacock ends up explaining the gesture. On NewsRadio, Bill says "It is the wise man who knows there's a lot he does not know." Matthew responds with a nose tap, "I know." In an episode of NCIS, Ziva makes this gesture while interrogating a perp. It's significant because it's the body language equivalent of an idiom, but she's not getting it wrong. Monk: Adrian Monk did this to get the hotel security during the episode in which Benjy sees a murder but Monk is the only person to believe him. On Cheers, when resident con-artist Harry the Hat went up against a card-shark who had been fleecing Coach, the card-shark coerced Coach to help him, claiming that Harry was scamming them both. They set up the 'finger-on-the-nose' bit so Coach could signal the card-shark if Harry had a bad hand. Coach, however, kept saying "I'm scratching my nose because it's itchy!". Needless to say Harry won the hand. In the end, it turned out that Coach was working with Harry to get back at the card-shark and get everyone's money back. That's right, Coach pulled a Xanatos Gambit! In Doctor Who, the Eleventh Doctor does this after checking a glass of water for vibrations. Eleventh Doctor: Sorry. Checking all the water in this area. [leans in close] There's an escaped fish [taps nose]. A Character Tic of the Tom Baker Doctor, revisited during his cameo in The Day of the Doctor, in a bit of Leaning on the Fourth Wall. The Curator: Who knows?... [taps nose] Who nose? With him it would literally be a Who nose. A related example; the Seventh Doctor had a habit of affectionately tapping his companion Ace's nose whenever she impressed him. Gus: ...that's what killed his nose! In an episode of Castle, the boys use the gesture as a reference to The Sting as they're discussing con men and con movies. At the end of the episode, Beckett repeats the gesture to a bank manager who'd just played along in their sting, revealing that she'd lied earlier about disliking the movie. In the Chinese soap opera The New Adventures of Chor Lau-heung , Chu Liuxiang has this habit as a characterizing trait every time he ponders something, especially when he's in full-on detective mode. One day, his love interest, Sikong Xing'er, asks him why he does that, but he doesn't know himself. She then adopts that nose-touching gesture, too. During the Tripod song "Justin", when they're trying to sing about Jesus without using either the name Jesus or any other word that could be connected to Christianity. Everytime they try to cover up something, Gatesy does this. Subverted when, near the end of the song, Scod complains that Gatesy is making fun of his huge nose, which Gatesy admits to. Gunnerkrigg Court: Bud demonstrates that having a nose isn't strictly necessary for pulling this gesture off, but it helps. In the Futurama episode "Spanish Fry", aliens steal Fry's nose. Amy asks if they were "little grey dudes with big oval heads," and Fry points to the blank spot in the middle of his face, only for Amy to reply that she "doesn't get that gesture." In a Halloween episode when the school is murdering kids and putting them into the lunches. Krabappel guesses what happens, Skinner touches his nose, Krabappel laughs and keeps eating. Homer: (whispering to the second Agent) I think he's talking to you! Super Duper Sumos: Part of their Transformation Sequence includes a pre-battle taunt. Kimo's taunt is to mockingly tap his nose. When asking a group of people for someone to volunteer to do an unpleasant task — clean the living room, take out the trash — the last person to touch their nose is the person stuck doing it. Urban Dictionary calls this "The Nose Game." There is a way to use this to your advantage. There is a subconscious desire to touch or point to the face when lying. This is especially true with touching or brushing the nose. Look for that when speaking with someone to at least partially tell if what they're saying is truth.